هذا الكتاب للباحث المصري د. فرج الحسيني، ومن اصدار مركز دارسات الخطوط بمكتبة الاسكندرية عام 2018 وتم طرحه للجمهور خلال معرض الكتاب الحالي في القاهرة. فيه توثيق لمعظم العمائر المملوكية الموجودة في عدة مدن سورية، وحتى لبعض المباني التي افتقدناها حديثاً كجامع يلبغا (تاريخ الهدم 1985). يقع الكتاب في 564 صفحة، بقياس 29 * 29 سم. – تعليقي على الكتاب: هو بالتأكيد مرجع هام يذكرني بكتب الراحل د. قتيبة الشهابي الموسوعية، وأتوقع أن يتبعه كتب أخرى عن العمائر الأيوبية والعثمانية. لكن أتمنى أن تتحسن طريقة استخلاص الكتابات وأسلوب عرضها، فبحسب ما شاهدت عند تصفحي للكتاب، هناك العديد من الاستخلاصات تمت على عجل وبدون مراعاة للتفاصيل الخطية. Mamdouh Al-Sharif, Damascus, Syria, 1885 – 1934. An Arabic calligraphy artist from Syria, a pioneer in many calligraphic forms, and a revival of the Kufi scripts in the Levant. He practiced and taught calligraphy in his studio in Damascus, and produced significant artworks in Syria and the Arab world. Today, I’m sharing with you a selected works of Mamdouh Al-Sharif in the Kufi scripts which I believe he exceeded at and added a new Arabian touch to the art of calligraphy whilst the Ottomans were controlling and limiting the Arab people’s life and even their Art back then! The sources of these works are from my archive and from the internet. Mamdouh has experimented in many styles, I’m starting with this minimal one, he played with the Square Kufi blocks to create an avant-garde piece. A masthead/logo for a cultural magazine that was published in Damascus. We see the courage usage of Kufi as a typographic line. Minimal gray tones outfit, and simple heart shaped cake! Immediately my eyes caught the artwork in their room: a beautiful piece by the renown Tunisian artist Nja Mahdaoui. 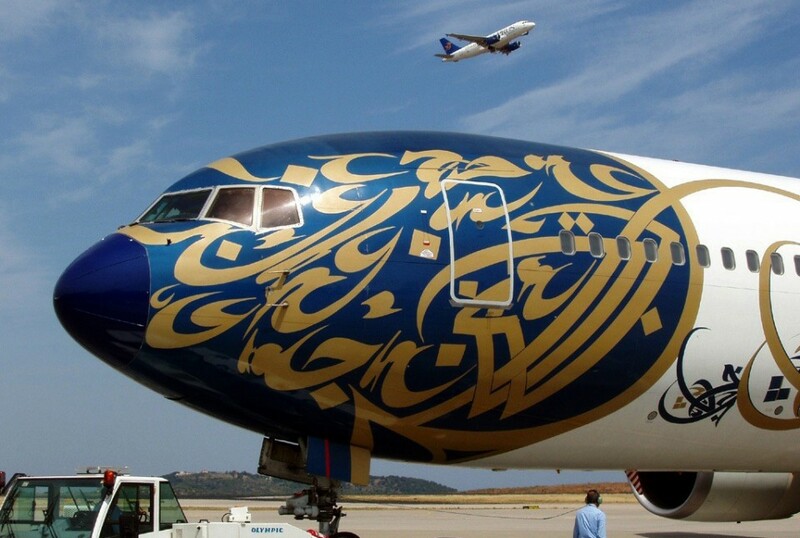 Nja is well known, his works are surrounding the world in all directions, and of course, he was the first Arab artist that wraps entire airplanes with his art, and maybe he is the first artist who uses lettering and calligraphy on such canvas – I really envy this man! So, no wonder that the Queen and the King picked such a sophisticated piece of art in their home. A great taste by a chic couple! Nja created a new movement for the Arabic calligraphy art, he was the pioneer of manipulating the Arabic letters to create a designed visuals, before even the Arabic calligraffiti was born. Now we come to the second photo. Modern home design pieces, elegant cufflinks, short suit jacket sleeves (! ), hands are clashing, eyes are weird, and finally: A beautiful framed artwork by Mounir El-Shaarani! Mounir El-Shaarani is an iconic influence for all Arab artists and designers (I excluded Arab classical calligraphers because they don’t like him) I met him once in 2008 here in Amman, such a lovely and wise man. Mounir has worked in diverse areas, he contributed to the Arabic type design by creating TheMix Arabic font with Pascal Zoghbi and Lucas de groot. Also he produced too many book cover designs and inner layouts for famous Arab magazines. Mounir has another approach when it comes to his practice in Arabic calligraphy, he focused on the content very deeply, then he executed the artwork with minimal colors and symmetrical classical layouts, the content issue makes Mounir an exceptional artist. For example, if you looked at all Muslim and Arab calligraphers in the past 500 years you’ll see all of their works have either a Quraanic or religious content, only!with a very few religious poetry as well. There is no prominent calligrapher has the courage to write something about the people needs, the street issues or about war or sufferings that a nation is facing. But Mounir; beside his modern poetry works and the common sufism quotes; he has extended his scope to reach the Syrian revolution matter in 2011, he produced stunning works that celebrate freedom, prisoners, arrested women and the national Syrian unity against the war. Artwork about the “Homeland”, inspired by the colors of the Syrian flag. No one has the guts before Mounir to do that, many calligraphers think in a naive way, they want to write any Quraanic verse and sell it directly to any wealthy customer, this is so pathetic in my opinion! And it has caused that freezing in the development of Arabic calligraphy art. A Poster that urges the world to stop killing in Syria: No one is listening dear Mounir. I can’t believe that such a bloody beastly man like Bashar Al-Assad is interested in Mounir’s work! It’s totally against Assad’s and his regime!! We are a classy people and a very humanistic regime, we appreciate art and design, we support local artists, and we do love Damascus / Sham and admires Mahmoud Darwish’s words about it, we are the truly civilized face of Syria, please help us to fight *terror. I’m very sad to finish this post with such a sarcastic/tragic way. I wanted to highlight the true taste of a wise man with his family from Amman that he loves to keep safe, and 200 km north of it a vampire beast of Damascus is lying to us, and to the whole world.